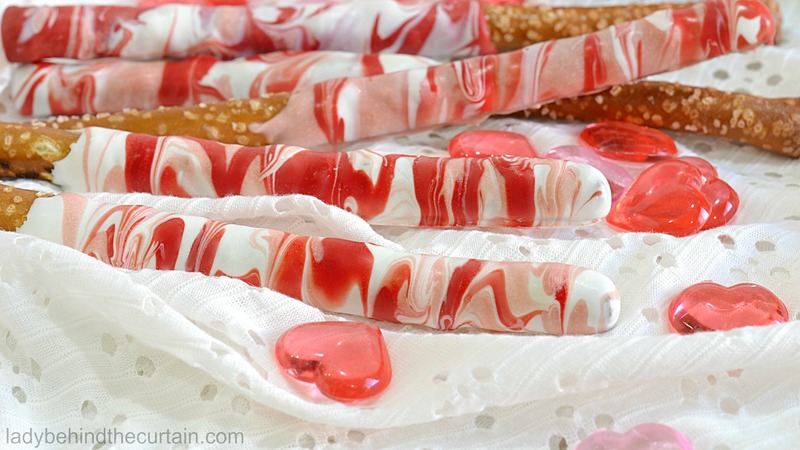 Marbled Valentine’s Day Pretzels | Create a work of art! 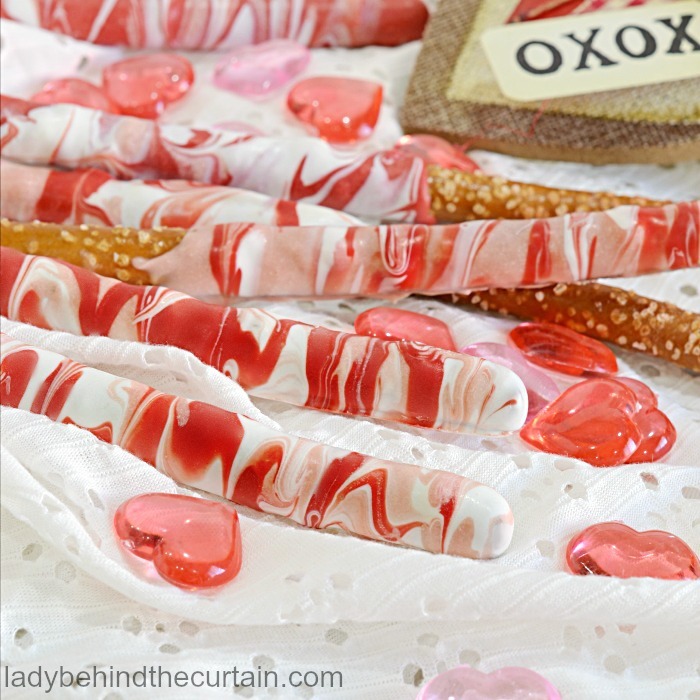 Wow your guests, co workers and friends with these easy to make fun and elegant Marbled Valentine’s Day Pretzels! 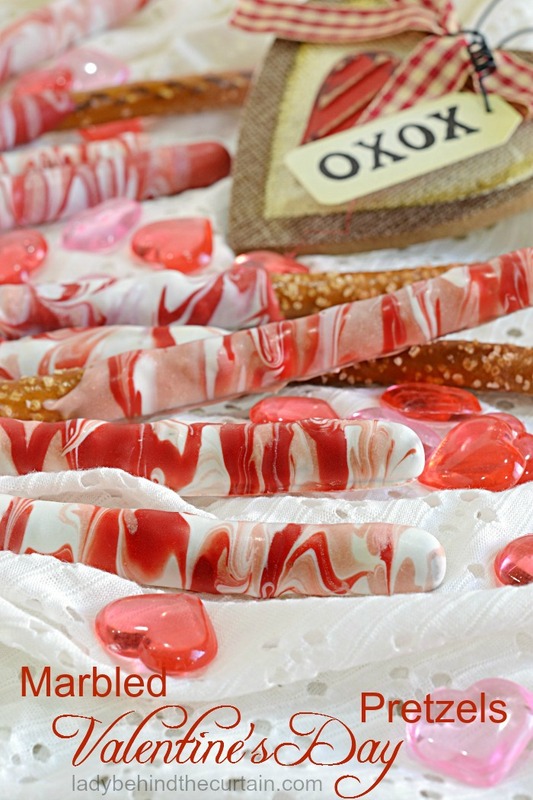 Don’t be fooled by how amazing these pretzels look! 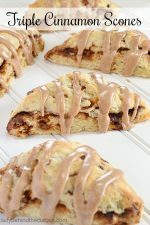 They are super easy to make. 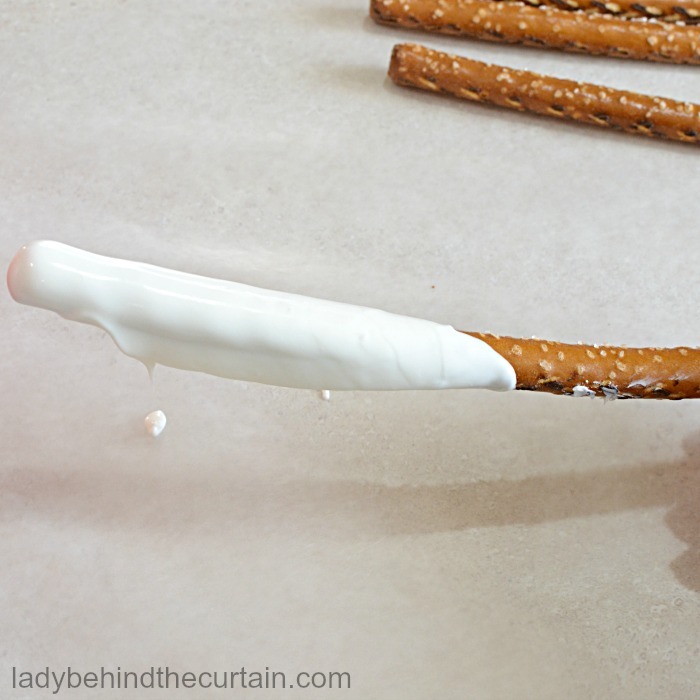 I will walk you through the process so you can make these marbled pretzels too! Kudos to my friend Karyn from Pint Sized Baker. She taught me everything I know about the marble effect. For this project I chose to use three colors. Two will work too! Have all three colors melted and ready to go. FOR MELTING: Place candy melts in a large bowl or jar. 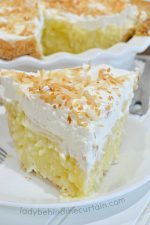 Melt in microwave at 50 to 60% for 1 minute, stir and continue heating in 30 second increments until the candy has melted and is a creamy consistency. 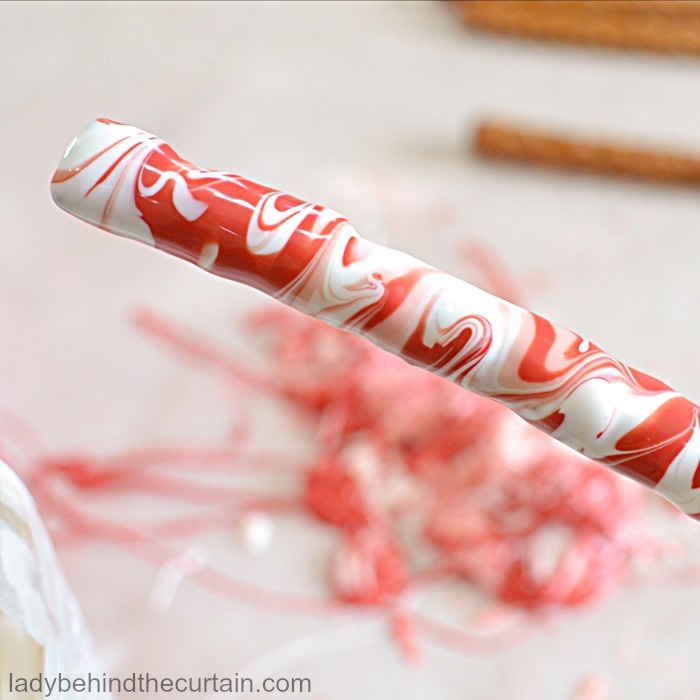 NOTE: If the candy is too thick add some shortening 1 tablespoon at a time until the right consistency is reached. One 12 ounce bag per color (equaling three bags) will cover approximately 20 PRETZELS! Dip the pretzel in the main color, DON’T TAP ANY OFF. The main color needs to be thick. 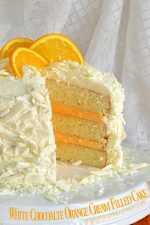 Take the other two (or one) colors and drizzle over the main color. 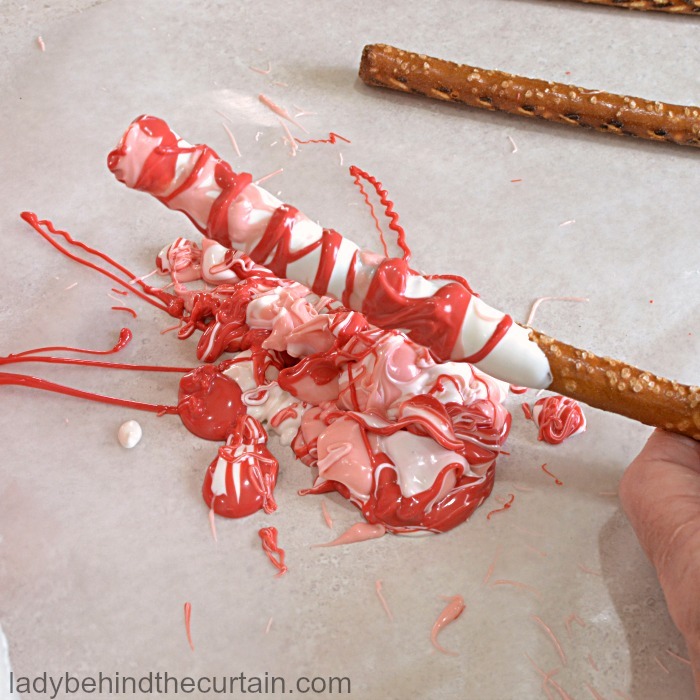 TIP: For less waste pour melted candy into small piping bags, snip the end and drizzle over coated pretzel. NOTE: With this technique there some waste. Turn the pretzel in one direction, lightly tapping with your finger. As you rotate you will begin to see the marbling affect. If you see an area you would like more color in. Simply add it but make sure to add it right away while the candy is still wet. 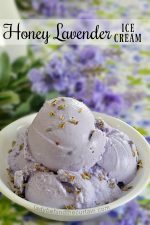 Place on a sheet of parchment or wax paper to harden. 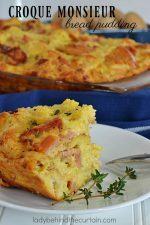 MIX IT UP! 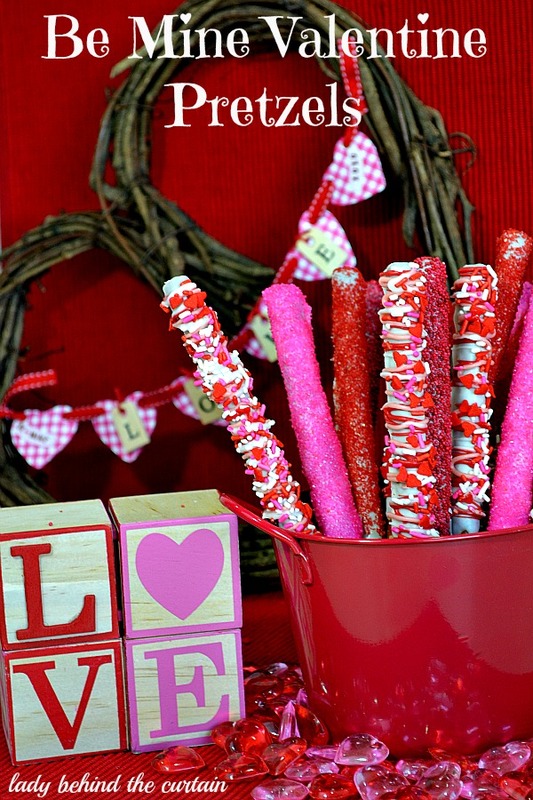 Add the BE MINE VALENTINE PRETZELS to the mix! Add these fun Valentine’s Day Cut Out Cupcakes to your Valentine’s Day Pinterest Board. Don’t have a Valentine’s Day board? Let me help you build one! Yield: Three bags fo candy melts will cover approx. 20 pretzels. Pour one color of candy melts into a large microwave safe bowl or jar. Microwave at 50 to 60% for one minute, stir and continue in 30 second increments until candy is smooth and melted. Dip the main color in the melted candy IMPORTANT do not tap off the candy the base coat need to be thick for this to work. Drizzle the other colors over the base coat. Turn the pretzel while tapping the extra coating off. 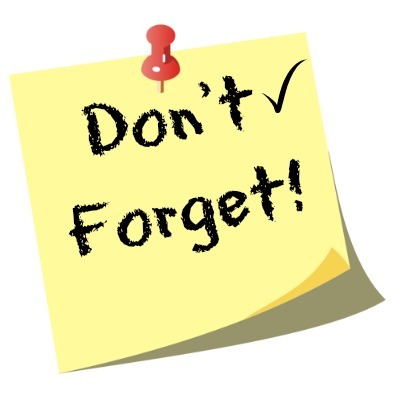 As you turn and tap this should create a marble affect. TIP: If you see a spot that needs more color, you can add it while the candy is still wet. Continue tapping and turning until the pretzel reaches the design you want. 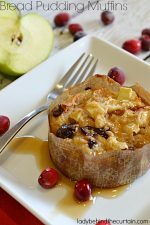 Place on a cookie sheet lined with parchment or wax paper to dry.